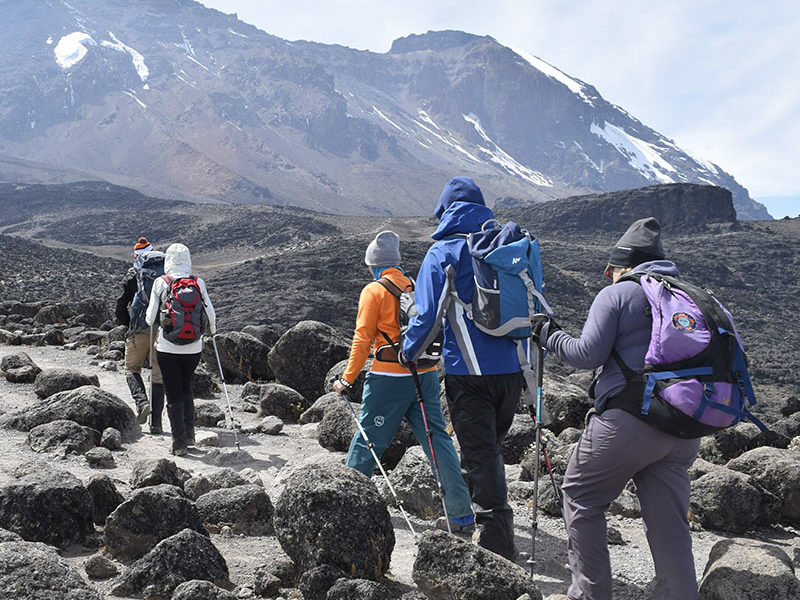 The Lemosho route 7 days is a very scenic hiking route, starting on the western slopes of Mount Kilimanjaro before merging with the Machame Route half way through. It leads you through a lush rain-forest, past the eerie forest and up to the Barranco Wall. 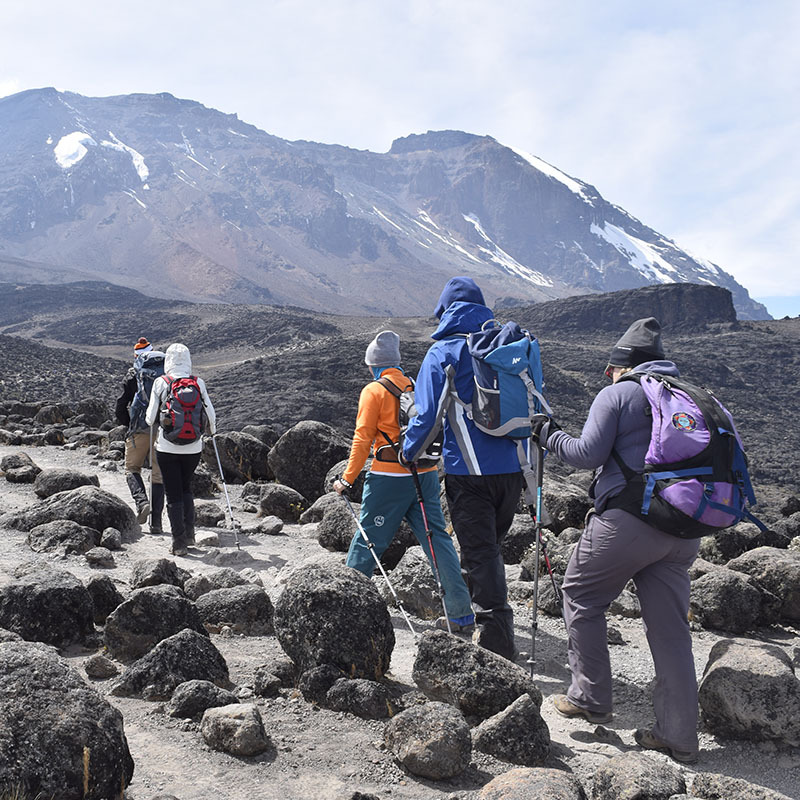 The altitude profile of the Lemosho Route is ideal for acclimatization, allowing climbers to hike to higher altitudes during the day than they’ll be sleeping overnight. The Lemosho Route can be completed in 7 or 8 days. We mostly recommend the 8 day Lemosho Route over the 7-day Lemosho Route to allow more time to acclimatize to the high altitude. Approximately 10:30 AM in the last day. Following an early morning breakfast, you will leave the moorland environment and enter the semi desert and rocky landscape. After 5 hours of walking east, you will be come face to face with the Lava Tower (4630m). Packed lunches are served at the Tower and hikers have the option of climbing the massive Lava Tower weather permitting. At this point of the hike, it is normal for hikers to start feeling the effects from the altitude including headaches and shortness of breath. After lunch, you will descend from Lava Tower (4630m) to the Barranco Campsite (3950m). The 6800m descent gives hikers a huge advantage to allow their bodies to adjust to the conditions of high altitude. The descent to camp takes around 2 hours to reach. It is located in a valley below the Breach and Great Barranco Wall (“Breakfast Wall”). Drinking and washing water and dinner will be served as hikers view the sun setting. After breakfast, you will begin your ascent. The trail intersects with the Mweka Route, which is the trail used to descend on the final two days. As you continue hiking for an hour, you will reach Barafu Hut. This is the last water stop for the porters because there is no accessible water at Barafu Camp (4550m). The word “barafu” in Swahili means, “ice” and this camp is located on a rocky, exposed ridge. Tents will be exposed to wind and rocks so it is important for hikers to familiarize themselves with the campsite before dark. An early dinner will be served so hikers can rest before attempting the summit the same night. Your guide will brief you in detail on how to prepare for summit night. Get to sleep by 19:00! Your guide will wake you around 23:30 for tea and biscuits. You will then begin your summit attempt. The route heads northwest and you will ascend over stone scree. During the ascent, many hikers feel that this is the most mentally and physically challenging part of the climb. In about 6 hours, you will reach Stella Point (5685m), located on the crater rim. After enjoying the magnificent sunrise, you will continue ascending for about 2 hours on a snow-covered trail to Uhuru Peak (5895m). Reaching the summit of Mt. 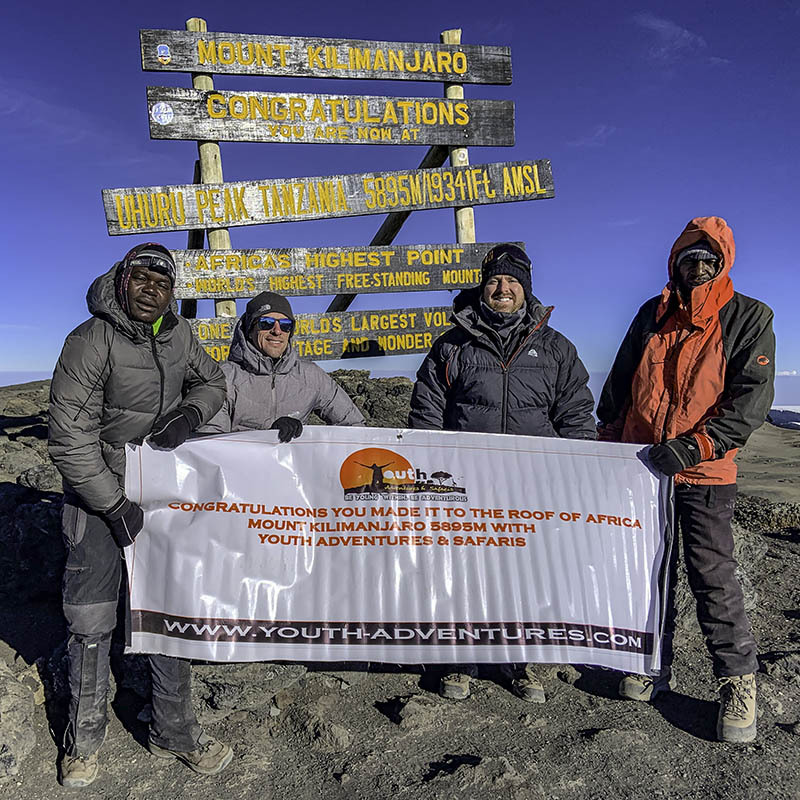 Kilimanjaro is a lifetime accomplishment! 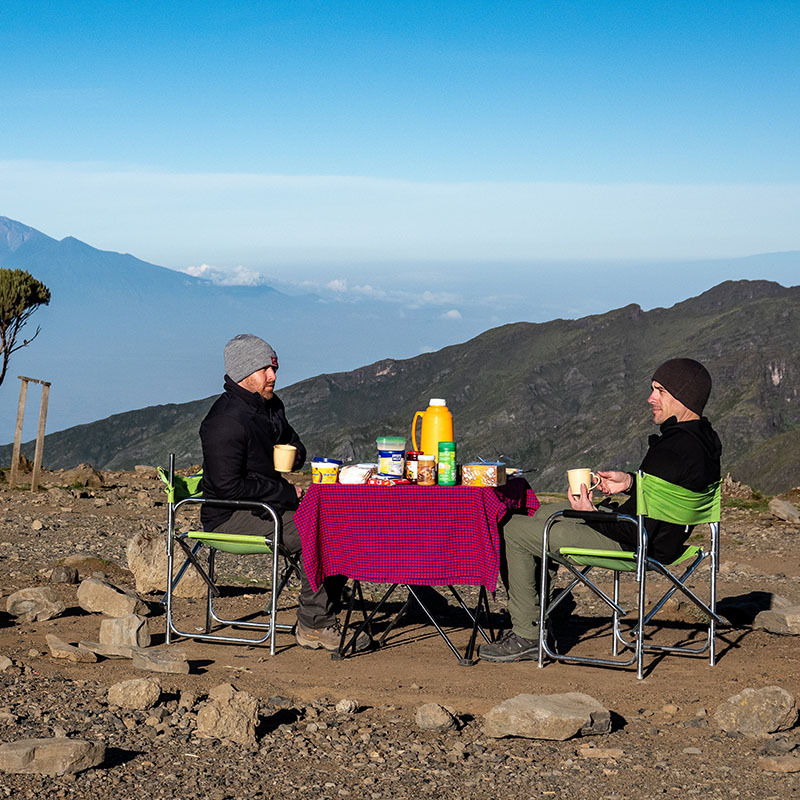 You will be able to spend a short time on the summit taking photographs and drinking tea before the descent to Barafu begins. The hike down to Barafu Camp takes about 3 hours. At camp, you will rest and enjoy a hot lunch in the sun. After eating, you will continue descending down to Mweka Hut (3100m). The Mweka Trail will lead you through the scree and rocks to the moorland and eventually into the rain forest. Mweka Camp (3100m) is located in the upper rain forest, so fog and rain should be expected. You will have a dinner, wash, and rest soundly at camp. Following a well-deserved breakfast, your staff will have a big celebration full of dancing and singing. It is here on the mountain that you will present your tips to the guide, assistant guides, chef(s), and porters. After celebrating, you will descend for three hours back to Mweka Gate. The National Park requires all hikers to sign their names to receive certificates of completion. Hikers who reached Stella Point (5685m) receive green certificates and hikers who reached Uhuru Peak (5895m) receive gold certificates. After receiving certificates, hikers will descend into the Mweka village for 1 hour (3 kilometers). And you will drive back to your hotel in Moshi.